Prototype: German Federal Railroad (DB) class 141. B-B wheel arrangement. The locomotive looks as it did in Era V with 5 lamps at each end, rounded vents with vertical grills, and without a continuous rain gutter. Model: Era V. The locomotive has a DCC decoder and extensive sound functions. It also has a can motor with a bell-shaped armature and a flywheel. 4 axles powered. Traction tires. The locomotive has separately applied metal grab irons. The engineer's cabs have interior details. 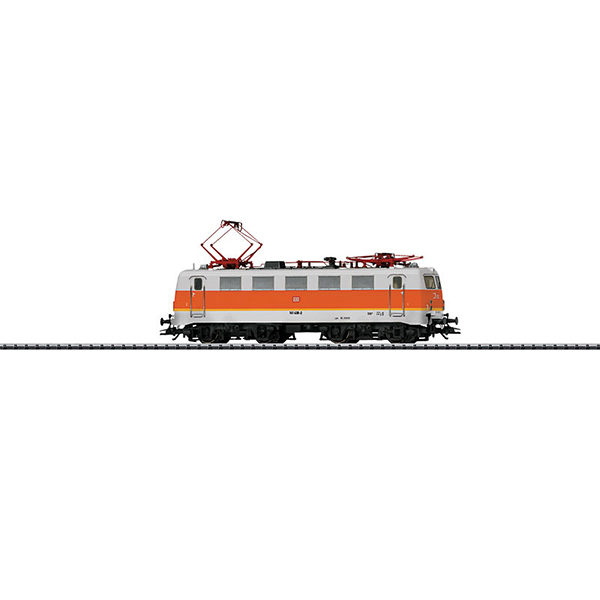 The locomotive has separately applied roof walks. The triple headlights and dual red marker lights change over with the direction of travel. The headlights are maintenance-free, warm white LEDs and the marker lights are maintenance-free, red LEDs. They will work in conventional operation, and can be controlled digitally. The locomotive has well detailed buffer beams. It also has NEM coupler pockets and a guide mechanism for close couplers. Length over the buffers 180 mm / 7-1/8. The Class E 41 - The Firecracker of the German Federal Railroad. In 1950, the German Federal Railroad decided to go ahead with the urgent modernization of its motive power with the purchase of electric locomotives with predominantly standardized components and contracted with all of the important locomotive builders to come up with appropriate suggestions. The goal was a locomotive for freight service in order to relieve the E 94 and a general-purpose locomotive such as was known with the well proven E 44. Another requirement to the builders concerned the engineer's cabs: For the first time the engineer was to do his work seated, which meant an immense improvement for engineers. The result of this request for bids was five experimental locomotives for the class E 10.0. However, exhaustive tests soon revealed that two prototypes would not be suitable for the expected tasks. Officials at the German Federal Railroad therefore decided to have Siemens/Krauss Maffei develop an express locomotive and a freight locomotive, the classes E10 and E 40, AEG/Krupp to develop a heavy freight locomotive, the class E 50, and BBC/Henschel to develop a commuter locomotive, the class E 41. A total of 451 class E 41 locomotives were purchased between 1956 and 1971. For several decades they left their stamp on more than just the commuter service from the Bavarian Alps to the German coast. This successful design can be considered as a general-purpose locomotive, since it was used as motive power for practically every kind of train service during its long service life. It did not last long in the rigorous S-Bahn service, because it did not have electric brakes required for it. Its traditional task remained commuter service, in particular in push/pull operation with Silberlinge / Silver Coins commuter cars. Due to the required low axle load distributed over 2 two-axle trucks, the E 41 could be used with no problem on electrified branch lines. The 4 traction motors on the locomotive represented a further development of the ET 30, and the Siemens-Schuckert Plant / SSW was responsible for the drive gear. They equipped the E 41 like the other standard design locomotives with a rubber ring drive gear system. The oil-cooled transformer was equipped with a relay layout on the low voltage side, which was the source of a characteristic noise on the class E 41. This locomotive soon picked up its nicknames Champagne Cork or Firecracker on the German Federal Railroad. More than a few railroad passengers, upon hearing this sound, thought the locomotive was damaged and were more or less irritated about it. The maximum speed for this 15.62 meter / 51 foot 3 inch long locomotive was 120 km/h / 75 mph. When the German Federal Railroad raised the maximum speed for express trains at the end off the Fifties to 140 km/h / 88 mph, E 41 locomotives coming after that were only painted in green, since the elegant blue was reserved only for fast locomotives in long distance service. During its entire service life, the class E 41, from 1968 on the 141, had double-arm pantographs. Otherwise, it changed externally as the result of rebuilding and ran in Germany from the Alps to the North with three or five lights at each end, with or without rain gutters, with rounded or square cooling vents and in the color schemes that changed over time. The train safety systems were also adapted along the way and the firecracker was considered a proven, reliable design right up to the end of its service. At the start of the Nineties, the class 141 was being increasingly replaced by the class 143, and its roster decreased more due to the switch to powered rail cars for commuter service. The official farewell to the class 141 took place in February of 2006 in Braunschweig, but the last operating district for several locomotives was Frankfurt/Main, where they did not leave active service on the German Railroad, Inc. until the end of 2006. Several of these popular locomotives have remained preserved and you can still hear the Firecracker of the German Federal Railroad at least on museum runs. This model can be found in an AC version in the Marklin H0 assortment under item no. 39412.